For years, our imprint specialty has been deep etch. This is created when the smooth surface of the crystal is sandblasted to create a recess. This recess then becomes a frosty-looking imprint and brings forth a beautiful design. Here are a few ideas to inspire some creativity! The process of preparing a piece of crystal for the process of etching, personalizing, and shipping involves many separate steps and is quite labor-intensive. The process begins in the hands of skilled artists and technicians who prepare an award for the etching process with meticulous care. 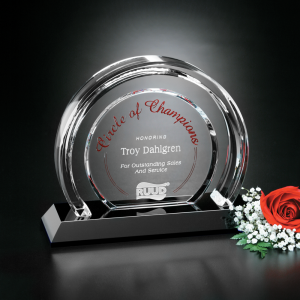 Many people assume that technological robots craft an etched crystal award using some sort of sophisticated computer program. 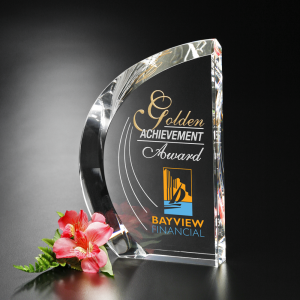 They are surprised to learn that each and every award is etched by hand, one at a time. The process of etching requires precision and speed; our etching professionals are artists as well as skillful technicians. Our Head Master Blaster absolutely loves his work and imagines just what it will feel like for the recipient to receive their award as he does his work. His dedication and love of recognition are transferred to each award one at a time, all day long, each and every day. The same is true of the experts who package our awards for distribution. The care they take is paramount. 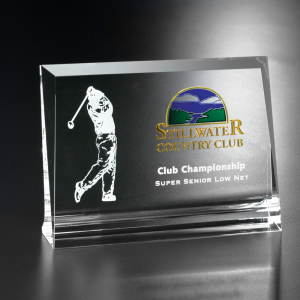 To download our personalized crystal product flyer, click here.